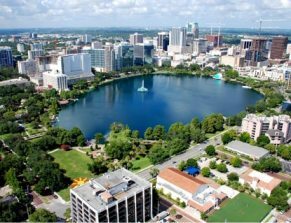 Lake Eola is popular destination in downtown Orlando, with many people taking advantage of the beautiful surroundings to walk at lunch times or the evenings. Of all the parks we visit, they don't come any nicer than this! Located in the very heart of downtown Orlando, the park offers activities such as jogging, cycling and walking around a sidewalk that circles the lake .9 miles in length, making it easy for you to keep track of your distances if you're the keep-fit type. The focal point of the park is Lake Eola Fountain that's always flowing, and at night time lights up with fantastic colours which changes frequently. As you take a walk around the lake you'll see lush tropical Florida vegetation and flowers, native birds, geese, swans, squirrels and lizards. To explore the lake, swan boat rentals, electric gondola boats are available from the Lake Eola Cafe kiosk (See details below). If you still have that Disney bug, join in the fun at the Walt Disney Amphitheatre which has many popular live performances, and then finish your visit by grabbing a bite to eat at the Relax Grill and enjoy the spectacular view of Orlando's skyline. We will keep updating this page via our RSS feed. regarding new additions, changes etc, so click onto the RSS feed above and follow the instructions to keep you on top off what's happening in and around Orlando, including updates for Lake Eola Park.